On the weekend of 9–10 June, instructors and members of Shorinjiryu Koshinkai Karatedo gathered at the Gold Coast to participate in the World Koshiki Karate-do Federation’s Oceania Cup and seminars with WKKF Founder, So Shihan Masayuki Hisataka. Koshinkai members participating included chief instructors Kyoshi Jim Griffin and Shihan Max Estens, Senior Instructors Shihan Des Paroz and Renshi Graeme Bowden, Instructors Tasshi Tony Fletcher, Tasshi Marnie Roberts, Sensei Mark Slingo and Sensei Leanne Sippel, and other members from Brisbane, Coonabarabran and Melbourne Dojos. On the Saturday, So Shihan Hisataka conducted a seminar that covered the WKKF approach to Bunkai Kumite, studying some bunkai applications from the kata Bassai. These looked at applications based on Juho (soft techniques), Goho (hard techniques) and Bukiho (weapons techniques). Following a break, some bogu kumite drills were covered, and the seminar concluded with a review of Koshiki competition refereeing and judging. With participants from Japan, Russia, New Zealand, Italy and Samoa, as well as from around Australia, we can all be proud of the strong performance of our Koshinkai contingent. Today, 10 June, marks the 65th anniversary of the formal founding of the Shorinjiryu Karatedo lineage of Kaiso Kori Hisataka (1907-1988). On 10 June, 1947, Kaiso Hisataka established the his original Kenkokan Dojo of Shorinjiryu Karatedo on the island of Kyushu, Japan. He later moved his Kenkokan Dojo to Tokyo, Japan. Of course, this is the date of official inception, but the Shorinjiryu style was obviously in development for a long time before that. In fact, the term Shorinjiryu is the Japanese pronunciation of the Okinawan term Sukunaihayashi, which was used by Master Chotoku Kyan (1870-1945), the principle teacher of Kaiso Hisataka. The September 2011 issue of Blitz magazine featured an article on Shorinjiryu Karate and Kengokan Dojo instructor, Shihan Des Paroz, written by Mike Clarke, Kyoshi. This article, Karate With a Twist, can now be found online on the Blitz website. Thanks to Sensei Adrian Cepak who acted as uke for the images in the article, and to Kevin Withnall for the photography. Over the weekend of the 20-22 April, members of the Australian Shorinjiryu Karatedo Association celebrated the 35th Anniversary of Shorinjiryu Karatedo in Australia – truly a major milestone. Founded by Shihan Lori Vanniekirk in 1977 as a branch of the Shorinjiryu Kenkokan Karatedo So Hombu Dojo in Tokyo, Japan, Australian Shorinjiryu Karatedo has been practiced continuously since that time by the instructors and members of the Australian Shorinjiryu Karatedo Association Inc.
During the National Camp of Shorinjiryu Koshinkai Karatedo (the school of Shorinjiryu Karatedo taught by the Australian Shorinjiryu Karatedo Association), the 35th Anniversary was celebrated by the members at a special dinner on the Friday night, and at a specially prepared Saturday evening meal and presentation evening. We were honoured to be joined for this special occasion by international visitors including Hanshi Myron Lubitsch, 9th Dan, and Shihan Troy Lester, 6th Dan, of the Shorinjiryu Kenryukan in New York, and Shihan Jeffrey Henderson, 6th Dan, of the International Budo Institute, along with the instructors and members of all dojo of Shorinjiryu Koshinkai Karatedo in Australia. The Australian Shorinjiryu Karatedo Association is the original association of Shorinjiryu Karatedo in Australia, and has operated continuously since the organisation was formed in 1977. With 8 active dojo along the east coast of Australia, we are proud to represent the largest group of Australian instructors and practitioners ofShorinjiryu Karatedo as founded by Kaiso Kori Hisatsaka (1907-1988). This is an important milestone, not only because of the history it represents, but the fact that this history provides the foundation for our continued growth into the future. We look forward to seeing the continued progress of these karateka. 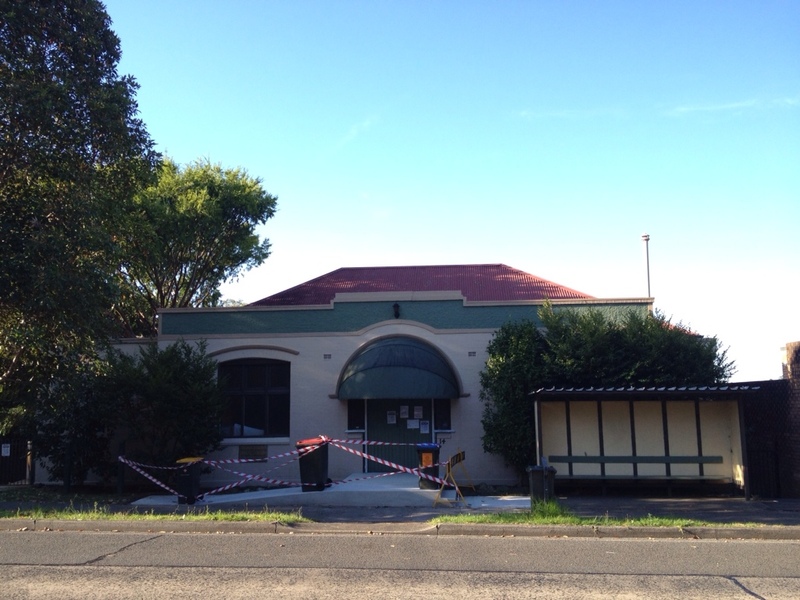 For the past few weeks our normal location for the Kengokan Dojo, Fairland Hall in Hunters Hill, has been undergoing renovations. The photo at right shows that among the renovations are a new ramp at the front entrance. As of today, 28 February, training will return to Fairland Hall. I look forward to seeing everyone back at our usual location, and I am sure we are all eager to see the results of the renovations. Information on finding the dojo can be found on our Dojo Location page. Tonight was our first training session at our interim location at the Henley Community Centre. Sensei Jo, Julie, Steven and Scott joined me for a sweaty session focusing on the kata Nijushiho. 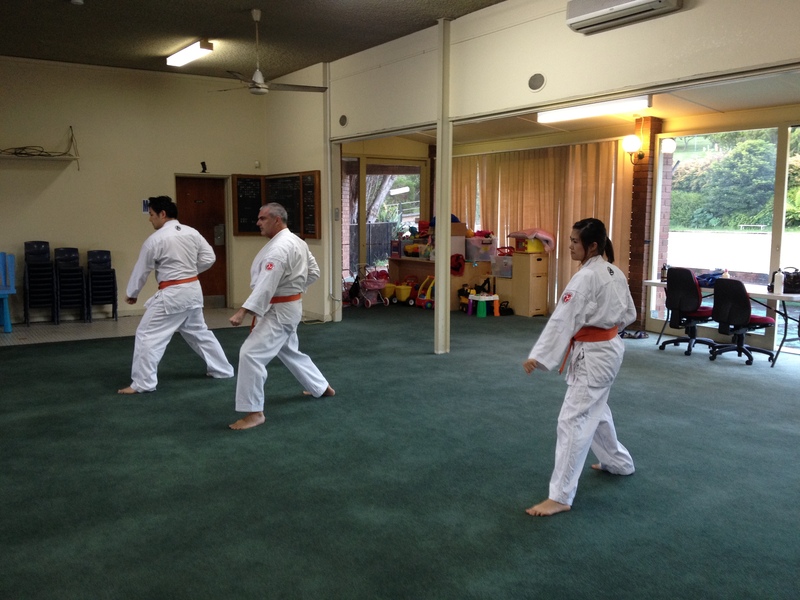 Nijushiho is new to all three orange belts, and they’ve tackled it enthusiastically. They’ve worked their way through the entire kata (both “sides”), and are bedding it down into their memories. Of course, having learned a variety of self-defences taken straight from this kata, they’re well on their way! The Henley Community Centre is a nice interim location, and we’re looking forward to the fresh perspective a change of venue will give us.